Spooling up with high-quality fishing line that fits the species, presentation, and conditions at hand is an easy and inexpensive way to boost your chances of catching more and bigger fish on every trip. Some anglers underestimate the importance of choosing the right line. But no matter what kind of rod, reel, and bait you’re using—or whether you’re casting, jigging, flipping, bobbering, or trolling—your line is a critical component during every part of the fishing process, from putting the bait in the strike zone to detecting bites, setting the hook, and pulling your catch into the boat or onto the bank. Early anglers fished with crude lines crafted from various materials such as silk and other natural components. But today, a wide variety of lines spun from high-tech materials offer incredible gains in performance and durability. The choices are many, but most fishing lines fall into one of three main families—nylon monofilament, fluorocarbon, and superline. Appropriately named, superline is a standout for its raw pulling power and uncanny sensitivity. And, while each line category offers benefits and can be a great choice in certain scenarios, thin-diameter, high-strength superlines such as Berkley FireLine, NanoFil, and Trilene Braid are hard to beat in a variety of situations—for a number of different species of fish. Among the benefits, superlines offer zero stretch under the pressures typically experienced when fishing. This results in unparalleled sensitivity, as the line faithfully transmits information from your lure or bait better than mono or fluorocarbon. So you feel the lightest bites, know when your lure is ticking bottom, or when your spinner or spoon is fouled with weeds. This is a major plus, whether you’re fishing bass or walleyes, pike or panfish. Superlines offer other gains that make them a top pick in a number of situations. Thanks to their superior tensile strength—the measure of breakload by diameter—you can use thinner line without sacrificing breakstrength. For example, a 30-pound-test superline may be the same diameter as 12-pound monofilament. Fishing with thinner line has a number of advantages. Since there’s less drag in the water, lures like crankbaits run deeper on the same pound-test superline as mono—with less line out, or “letback.” Medium-diving lures become deep runners, without the extreme, hard-to-reel-in resistance of a super-sized bill. This can be a big deal when you’re casting for hours at a time. Thin lines also slice through vegetation like a switchblade—which is important whether you’re wrestling a trophy bass from heavy cover or trolling walleyes in a summer weedbed. When fighting fish—the zero stretch and Herculean strength also come to your aid. 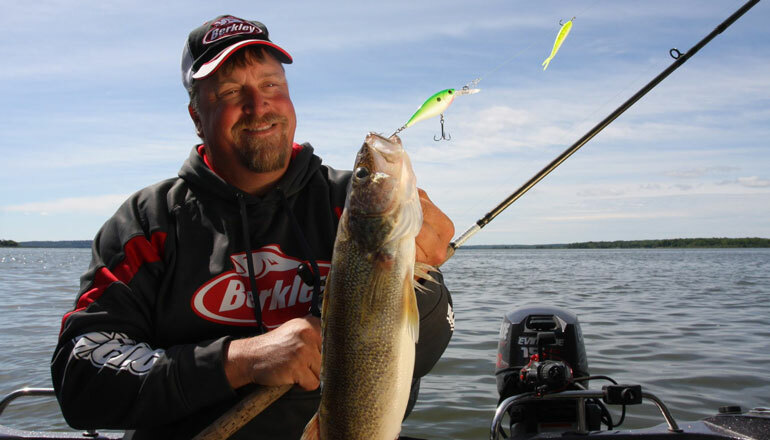 On the trolling front, a great setup for plucking plump walleyes from the weeds is a 3-foot-long nightcrawler harness and spinner rig, weighted with a 1- to 3-ounce bottom bouncer, towed slowly through the grass on 10-pound Berkley FireLine Ultra 8. Keep your line at a 45-degree angle to the water to maintain control and hang on—because strikes from weed fish can be savage. That’s not to say superlines are only for fishing the thick stuff. They also excel in open water for a number of applications. For example, when trout roam open water in depths of 10 to 20 feet—common in early to mid-summer as the fish shift away from shoreline shallows on their way into deeper water offshore—superline is an excellent choice when fishing jigs tipped with softbaits like Berkley Havoc Tubes, PowerBait Power Tubes, Gulp! Minnows and Jerk Shads. To avoid spooking the fish in clear water, add a 2- to 3-foot leader of 10-pound-test Berkley 100% Trilene Fluorocarbon. Jig weights range from ¼ to 1½ ounces, depending on depth and conditions. The presentation is simple: drop the jig to bottom and begin a steady jigging cadence. Spice it up with short snaps, drops, and pauses. It’s worth noting that super-thin superlines cast farther than fatter lines. 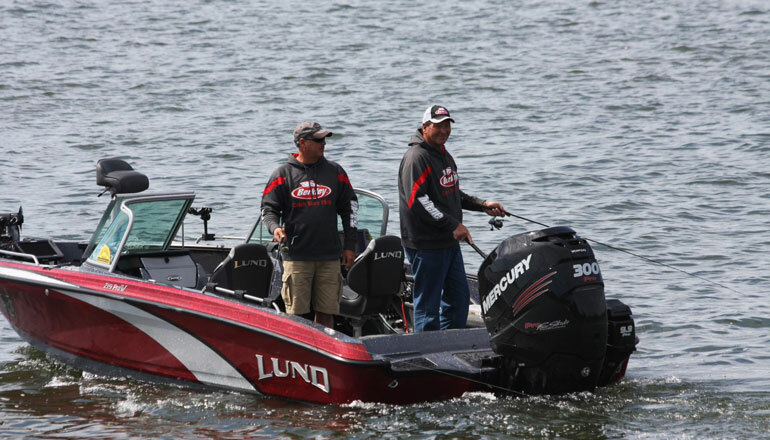 Rounded superline like Berkley NanoFil casts a country mile, even with light lures. But other options like FireLine Ultra 8 and Berkley Braid aren’t far behind. Long casts are great when you want to cover more water with each cast. But they’re also invaluable when casting to fish in shallow water, which might spook if you move in too close. One proven setup for shallow-water bass, walleyes, and other predators in spring and fall is a 3- to 3½-inch Berkley Ripple Shad on a ¼-ounce jig. Use a medium-weight spinning outfit spooled with long-casting Berkley NanoFil or Ultra 8. Add a 3-foot leader of Trilene 100% Fluorocarbon. Make a long cast, let the jig fall to bottom, then rip the bait upward to get the Ripple Shad’s tail kicking. Hold your rod up and let the jig swim forward until it hits bottom. Then pop the jig a foot off bottom, let it swim toward you again, and repeat until a fish hits or the jig reaches the boat. Superline is a great choice for casting lures in deeper water, too. One top multi-species option for bass, walleyes, and pike is a 3½- to 4½-inch paddle- or curly-tail Berkley PowerBait, Gulp! or Havoc softbait on a ¼- to ½-ounce jig head. Spool a7-foot spinning combo with 10- to 14-pound Berkley FireLine Fused Crystal or Ultra 8, or Trilene Braid of the same test. Here, superline gives you the advantage over other lines because you can feel the jig ticking bottom, the bait’s tail action, and the feeling of a predator overtaking the jig. To help visualize the location of your jig and detect strikes, choose a high-visibility mainline tipped with an 18-inch fluorocarbon leader. The presentation is simple yet deadly. Cast the jig out, let it settle, then make a slow, steady retrieve just above the bottom—no hopping and popping necessary. These are just a few examples of the many situations in which superline is a great choice. In truth, they’re a top option anytime thin, strong, sensitive line is a benefit. Don’t forget that superlines like Berkley FireLine Ultra 8 and Trilene Braid are also exceptionally abrasion resistant, which adds to their performance when you’re fishing in and around nasty cover and structure that would shred lesser lines. 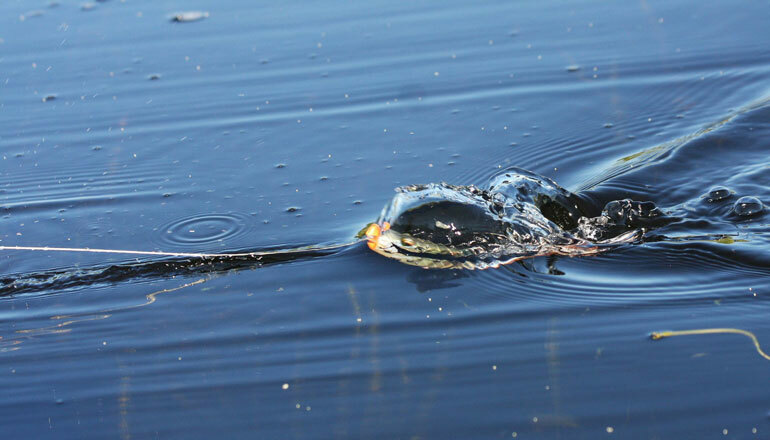 Superline floats, too, which makes it perfect for fishing topwater lures like artificial frogs. In contrast, nylon mono sinks slowly and fluorocarbon falls even faster. It’s just another point to keep in mind as you decide what to spool up with for your next fishing adventure.